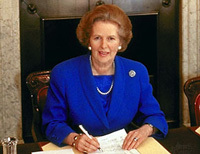 This was the “Winter of Discontent,” when Great Britain came about as close to economic collapse as at nearly any point in its peacetime history, and it was the country Margaret Thatcher inherited when, on May 3, she defeated the [liberal] Labour government of James Callaghan to become Prime Minister – the first woman in the office and 49th in a line that includes some of the greatest figures of Western civilization: Winston Churchill, Benjamin Disraeli, the Duke of Wellington, William Pitt the Younger. Thatcher died in London Monday, at age 87, having earned her place among the greats. This is not simply because she revived Britain’s economy, though that was no mean achievement. Nor is it because she held office longer than any of her predecessors, though this also testifies to her political skill. She achieved greatness because she articulated a set of vital ideas about economic freedom, national self-respect and personal virtue, sold them to a skeptical public and then demonstrated their efficacy. Consider economic policy. Britain in 1979 had a double-digit inflation rate, a top income tax rate of 83% and rising unemployment. Public expenditures accounted for 42.5% of GDP. There were price, dividend, currency and wage controls, although the last of these were flouted by trade unions on whose support the Labour government depended. The government accounted for about 30% of the work force. The state controlled most major industries: British Aerospace, British Airways, British Telecom, British Steel, British Leyland, the British National Oil Corporation, Associated British Ports, Cable and Wireless, Rolls Royce. What was left of a private economy was smothered in red tape. Thatcher was different, an “instinctive conservative” whose economic philosophy drew from her father’s observations of stocking a grocery. Her memoir recalls her youthful wonder at “The great complex romance of international trade which recruited people from all over the world to ensure that a family in Grantham could have on its table rice from India, coffee from Kenya, sugar from the West Indies.” She had also, with her cabinet colleague Keith Joseph, spent years transforming those instincts into practical theories for governance. And so it went for the next 11 years, as Thatcher and her government stopped printing excess money to kill inflation, cut marginal tax rates to unleash private incentives, privatized public housing so the poor could own their own homes, did away with currency, price and wage controls to eliminate the distortions they imposed on the economy, curbed runaway spending and sold off one state asset after another so they might be competently and profitably managed. But staring down labor unions was the least of it. In March 1979, a faction of the Irish Republican Army murdered Airey Neave, her campaign manager. Eleven years later, they murdered Ian Gow, her former private secretary. There would be IRA outrages at the Harrods department store, in London’s Hyde and Regent’s Parks, in Enniskillen, Northern Ireland, and, in October 1984, at the Grand Hotel in Brighton, where Thatcher was herself the principal target. None of this cowed Thatcher, who understood that the main threat IRA terrorism posed wasn’t so much to British sovereignty in Northern Ireland as it was to the very concept of majority rule. The same went for the Falklands. Critics of that war paint it as a display of jingoism, carried out chiefly for Thatcher’s political convenience. Yet the issues at stake were larger than the possession of some rocky and frigid islands in the South Atlantic. Would Argentina’s unprovoked aggression be resisted or rewarded? Would 1,800 Falklanders – loyal to the Crown, English-speaking – be consigned without real protest to foreign rule and dictatorship? There should never have been any serious argument over these questions, but there was. And looking back, it’s remarkable how much Thatcher was willing to risk in a fight lesser statesmen would have skipped. Britain lost six ships and suffered hundreds of casualties in the war. But in fighting Thatcher showed that Britain was prepared to defend its rights, its interests and its principles – intangible assets of nationhood that had once made the country great. Deeper than this was Thatcher’s sympathy with what is best in America: freedom, enterprise, opportunity, optimism and the urge for self-improvement. No doubt this reflected Thatcher’s background as a grocer’s daughter who’d risen on her own talent and effort. It did not, however, always reflect British or even Tory opinion, which was (and remains) prone to seeing the U.S. as a coarse, overbearing ally. Preserving the “special relationship” is more than the default option of British leadership: It is a political choice that has to be defended against alternatives such as “Europe.” Thatcher, like Churchill before her and Tony Blair afterward, always made the choice to remain close to America, one reason the three are often admired more in the U.S. than at home. Over Thatcher’s long tenure there were bound to be misjudgments. Whatever the policy merits of her “poll tax,” its implementation was badly handled and ultimately led to her political downfall. A larger blot were the terms of the handover of Hong Kong to Chinese rule with no guarantee of democratic self-rule. We remember her vigorous defense of that decision when she visited our offices in the mid-1980s, which she punctuated by asking: “Do I make myself clear?” She had, but the colony’s six million British subjects deserved better from such a champion of freedom. Still, the failures dim next to the overall legacy. Thatcher came to power when Britain and the West were in every kind of crisis: social, economic, moral and strategic. Along with Ronald Reagan and Pope John Paul II, she showed the world the way out. She believed in the inherent right of free men to craft their own destinies, and in the capacity of free nations to resist and overcome every kind of tyranny and injustice. These were the right beliefs then as now. She was the right woman at the right time. Published April 8, 2013 at The Wall Street Journal. Reprinted here April 11, 2013 for educational purposes only. Visit the website at wsj.com. 1. Tone is the attitude a writer takes towards his subject: the tone can be serious, humorous, sarcastic, ironic, inspiring, solemn, objective, cynical, optimistic, encouraging, critical, enthusiastic… Which word do you think best describes the tone of Mr. Kohlmayer’s commentary? Explain your answer. 2. The purpose of an editorial/commentary is to explain, persuade, warn, criticize, entertain, praise, exhort or answer. What do you think is the purpose of the WSJ editors’ commentary? Explain your answer. 3. From this commentary, what impression do you get of Margaret Thatcher as a prime minister? List three adjectives you think best describes Mrs. Thatcher. Explain your answers.